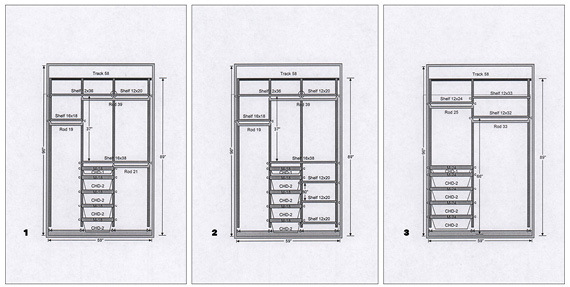 Today, still working on the project in Jersey City, I am focusing on a layout for a modular reach-in closet. At this point, all four of them are drawn diagrammatically, as identical blocks. So far, I've assumed that 5 linear feet is enough per bedroom. If that's wrong, the entire floor plan will have to be reconsidered. Before going to the closet design experts at The Container Store, I have to do some prep work and think strategically. When the space is limited, it is especially important to visualize it three-dimensionally in order to maximize vertical volume. For utmost flexibility or adaptability, I have to brainstorm and outline my specifications. These are the ground rules. Next, I have to work it all out based on hypothetical storage needs. They can be quantified using elfa Closet Makeover Guide available on The Container Store's website. So, let's see... What bells and whistles should I have in the proverbial 5-foot-no-door reach-in closet? I doubt it will all fit in 5 feet. Perhaps, storing shoes and handbags elsewhere is an option. 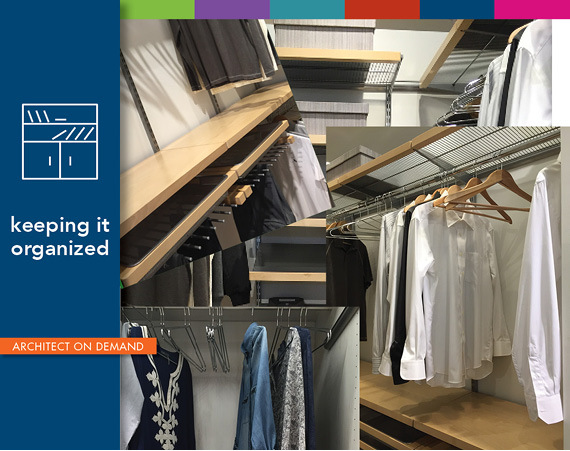 If it were a walk-in situation with an island, jewelry and accessories can be placed in a dedicated drawer or several... We'll just handle the clothes in the 5 feet that are available. O.K. 2 short hanging rods will take up the bulk of space. Let's say 3 feet. I can live with a 12-inch long hanging rod. That leaves 12 inches for drawers. I can install shelves at the top to store seasonal items, such as scarves, gloves, and hats. Such a pleasant, welcoming environment! I go straight to a counter where an in-store designer Tamara is working at a computer. She smiles and immediately switches gears to help me. I explain the project. Thankfully, Tamara thinks that a lot can be done in 5 feet. We arrive at 3 possible configurations together. It seems that the second one is the winner! It provides long and short hanging, 5 drawers, plus shelving. It gives plenty of storage options. I am satisfied! There's a lot to be said for clutter-free home! It feels so much cleaner and more spacious when dining room and coffee tables are not overflowing with stuff. Certain calmness is achieved when everything is streamlined and neatly put away. Wouldn't you agree that closet organization is the first step toward preventing clutter from taking over? I would love to hear your thoughts here. Alla is an architect on demand advising DIY home improvement enthusiasts online.